Cyprus is a small island in the Mediterranean with a vast amount of history. In mythology, Cyprus was the birthplace of the Ancient Greek goddess of love, Aphrodite, who sprang from the sea foam near its shores. Cyprus is also home to what may be the world’s oldest wine. The island has a long and fascinating history where idols, ruins and temples, graves and goddesses are the fabric of everyday life. 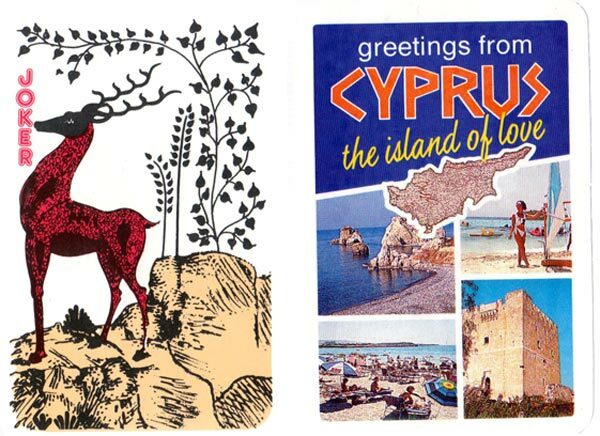 Above: Cyprus souvenir playing cards showing scenes alluding to ancient history and myths. Images courtesy Rex Pitts.